Music games have a bad rep and it’s not because they’re poorly made or they aren’t fun to play. Although you can’t stab a dragon in the face before turning into a werewolf in real life like you can in Skyrim, you can still pick up and teach yourself to play a real guitar instead of playing a simplistic imitation like Rock Band or Guitar Hero. Because of this and because learning to play guitar is a rite of passage for so many, music games get a lot of flack. Despite its appearances, though, Rocksmith isn’t a game that teaches you how to be a shallow imitation of a rockstar. It’s a piece of learning software that teaches you actual guitar. Using a USB peripheral that plugs into your guitar, Rocksmith acts like an intelligent amp that can register and distinguish every note you play. It’s an awesome technological innovation that knows when you’re playing a song right because it can read the notes being played. Unlike other music games, Rocksmith’s goal isn’t to emulate the “rockstar” feel or burden you with unnecessary challenges – its main goal is to teach you how to play guitar. Although you can’t “fail” a song or a challenge, Rocksmith has a sensor that gauges your level of skill by the amount of notes and phrases you play correctly. The worse you do, the less notes there are to play. The better, the more notes and chords appear until you’re playing the song in full. It’s a clever design that keeps the player from getting frustrated while still teaching them the skills necessary to be a better player. While I’ve run into a few issues with the game incorrectly reading a note I was playing or not reading a note at all, careful tuning can often fix this. Depending on the guitar you use, you may have to come up with a few quick fixes to make it work (I have to tune the “e” a bit flat everytime I play), but I haven’t run into any major issues. A recent update just came out that now supports bass, and it works just as well as the guitar. You will need an actual guitar or bass (you can use your guitar to play bass, as an alternative) to play this, but again – this is largely a learning peripheral so if you don’t have these instruments already, then there’s no point in purchasing this game. Acoustic guitars may require additional equipment to work, but again – it all depends on the guitar. So, how well does it work at teaching you how to play? At the start of playing this, I had absolutely no experience with guitar. I’ve tried learning how to play through books or with online resources, but they gave me more questions than they answered. I really can’t stress enough how awesome this game is at teaching you to play guitar. While I’m still nowhere near an expert level, it’s very encouraging to see the progress I make each day broken down into very apparent terms. 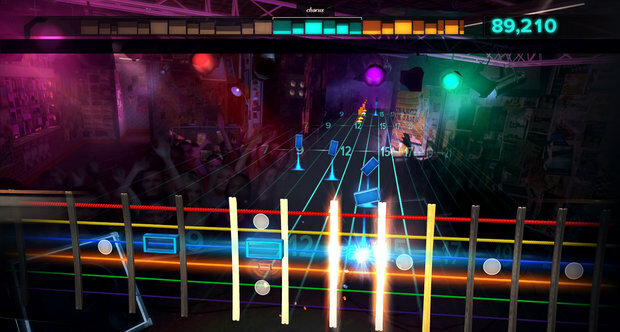 Rocksmith features a handful of “arcade” games that each emphasize the practice of a certain technique, like a galaga type game that needs you to string the right notes to hit each target. Like so many other things in this, these games distract you from the monotony of practice, and after the nth round – you’ll find yourself 10 times better at playing than you were before. Rocksmith does fall short of being a “video game,” though, and the visuals are drab and uninspiring. While there are a lot of cool pedals and other things to unlock that you can use in a “free play” mode, the venues you play in are barely indistinguishable from one another and it feels meaningless to unlock them. Despite this and despite the fact that this game won’t make you feel like a rock star, it will teach you to be one. Purists may still sneer at those learning to play guitar with a video game, but in a world where so many people argue against the value of video games already – Rocksmith is an amazing counterargument that is absolutely worth the time and money.